Toyota's Crown sedan, shown as a concept. TOKYO -- Toyota will update two of its most staid and storied nameplates at the Tokyo Motor Show this month while exploring new hybrid ideas with sporty car and crossover concepts. The concepts look to a funky, more emotional future. 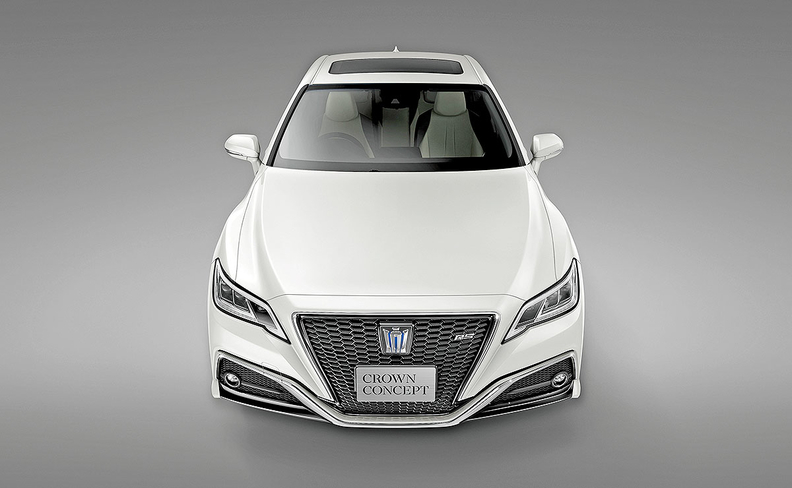 But the production-car upgrades target the Crown sedan and Century limousine, two Japan-market-only nameplates that date back decades. The Crown, first introduced in 1955, gets redesigned from scratch on Toyota Motor's new modularized global platform. Toyota's latest connectivity and safety technology, including pre-crash auto-braking, go into the next-generation Crown, which goes on sale in Japan next summer. The new Crown even earned some performance chops in track testing on Germany's famed Nurburgring circuit. It's not the first time Toyota has tried to invigorate the Crown. With the release of the current generation in 2013, Toyota offered the car in a hot pink paint job and designed one variant with an imposing, massive Darth Vader-style grille. The Century's exterior was last redesigned in 1967, and the next generation looks much the same. It will go on sale in Japan in mid-2018. 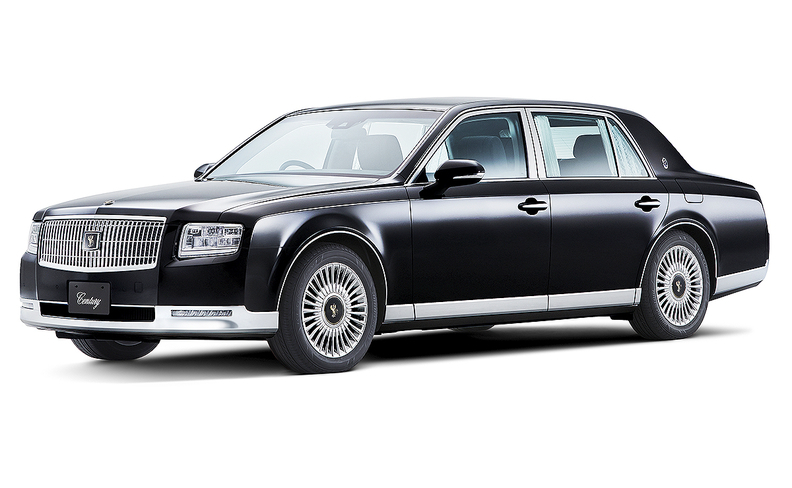 Toyota is also bringing the Century limousine into the 21st century by dropping the previous V-12 engine, built solely for the Century, for a 5.0-liter, V-8 power plant mated to the brand's trademark hybrid system. The Century also gets modern amenities such as pre-crash auto- braking, blind-spot detection, LED headlamps and, finally, power leg rests for the VIPs riding in back. But the iconic long car — the go-to choice of Japanese emperors, prime ministers and esteemed captains of industry — largely sticks to its old-school elegance. The Century's exterior was last redesigned in 1967, and the next generation looks much the same. It will go on sale in Japan in mid-2018. Pricing wasn't released, but the Century has always carried a sticker just above the top-of-the-line Lexus. On the concept front, Toyota says it will explore a new genre with the Tj Cruiser, a monolithic crossover that merges the roominess of a cargo van with the feel of an SUV. The "T" in the name stands for toolbox, apt given the concept's boxy dimensions. Toyota says the "j" stands for the joy that riders get from venturing to different destinations. Toyota envisions the Tj Cruiser as running on a 2.0-liter-class engine mounted to a hybrid system and available in either two- or four-wheel-drive layouts. The rear doors slide open like a van, while the entire interior emphasizes creative cargo space and seat manipulation to accommodate everything from bicycles to surfboards. In addition, Toyota shows its sporty side with the GR HV Sports concept. It draws heavily from the 86 sporty coupe — a version of which is sold by Subaru as the BRZ — with a couple twists. For starters, it gets a pointier nose and a vertical array of LED headlamps. It also gets a targa top, in homage to such venerable convertible forerunners as the Toyota Sports 800 and the Supra. Toyota says its matte black finish expresses "power and aggressiveness." Powering the car is the Toyota Hybrid System-Racing, the electrified drivetrain technology used in the TS050 racer Toyota enters in Le Mans and the World Endurance Championship. The battery is mounted near the center of the car to improve performance handling. Adding to the fun is the ability to switch back and forth between six-speed manual and automatic transmission modes. The push-button ignition is at the tip of the shifter. "Drivers can delight in the performance of THS-R in a genuine sports car," Toyota said, "while experiencing a sense of freedom thanks to the targa top."